Wichita's finest shopping. Browse this visual showcase of area shopping establishments for gifts, furniture, music, pets, electronics sporting goods, housewares and more. Aida's in Wichita's Old Town district offers beautiful jewelry, handbags, and gifts and more. Wichita's favorite BBQ specialty shop! Everything you need for entertaining outdoors: from grills, smokers, and gourmet goods to fire pits and fine patio furnishings. Selling and buying electronics, power tools, jewelry, musical instruments and hand guns. We're the fast and easy way to get a quick loan! Taking care of all your home furnishing needs in both east and west Wichita since 2002. Wichita’s treasured specialty fashion store featuring women’s clothing, jewelry, shoes and accessories. Come tell us about your style and we’ll find a look you’ll love. A collection of unique boutiques located in the Douglas design district. Also featuring a restaurant just as unique as the shops it sits next to. Wichita's home for exotic birds and bird supplies. Cero's quality chocolates and fine candy since 1885. Come see us for fresh nut clusters, truffles, gift boxes and more at 3429 E Douglas, next to Happiness Plaza. We are a full artisan guild where all of our chainmaille is made by hand and is 100% guaranteed for life. We are also a retail and collectable store. An impressive showroom of game and pool tables along wth bars and bar stools in downtown Wichita. Your place to find antiques, restaurants, salons, clothing alteration, art, floral shops, gifts, therapeutic massages, & professional services and more. Handmade home & body products made with the best products available. Cocoa Dolce Artisan Chocolates creates chocolates with meticulous attention to ingredients, taste, texture and finish. Neighborhood locations with superstore prices. We stock a large selection of wine, beer, and spirits for you to choose from at an everyday low price. Wichita’s oldest and most diverse luggage specialty store. Miles of locally owned stores, trendy shops, cafes, bakeries, pubs, and over 32 merchants catering to home design. Get your car, semi or truck unstuck with Go Treads unique tire traction tool! Dedicated to recording and exhibiting the importance of railroad transportation in Kansas history. Grene Vision Group Optometrists, Ophthalmologists and Staff are dedicated to providing Total Eye Care and Eyewear for the Entire Family in 22 Kansas Locations. A benevolence ministry with a unique Gift Boutique...antiques, collectibles, fur coats, jewelry, paintings and much more! Award-Winning Service & Sales of Wood, Gas and Pellet Stoves, Fireplaces & Inserts. All Types of Chimney, Brick & Stone Repair since 1979. We pride ourselves on offering value at all price ranges, which make us the place you can't afford NOT TO shop. Jim Starkey Music Center Inc.
Wichita's premiere instrument retailer, lesson studio and repairs shop. Locally made lip balm with fine, simple ingredients. We have been in business since 1976 and are one of Kansas largest Pawn Shops. We have 35 years of experience in instrument repair and sales. We carry musical instruments, accessories, stands, reeds, mouthpieces, and more in our Wichita music store. 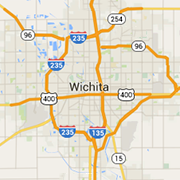 Wichita kitchen appliances, delivery & setup! Maytag, Kitchenaid, GE, Amana, Whirlpool, Wolf, Bosch, Thermador, Viking, Sub-Zero, Speed Queen and more! All-natural, handmade products for men and women. Great for all hair and skin types. Men, try our popular beard butter! Patricia’s, Where Fun and Fantasy Meet, is a classy adult boutique with an upbeat atmosphere that is comfortable and inviting. Puff's is Wichita's favorite vape shop carrying e-cigarettes, vaporizers, flavors and more. Start your healthier smoke-free lifestyle today! Find a business near you. No contests at this time.